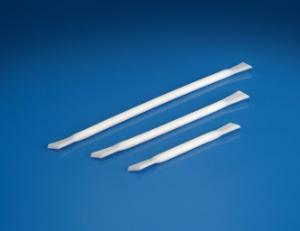 These stirrers are ideal for precipitates and residues. Unbreakable and heat resistant to 550 °F (288 °C), they will not crack or break under several conditions, such as thermal and mechanical shock. Will not scratch glassware. Chemically inert PTFE offers resistance to adhesion of practically any material.